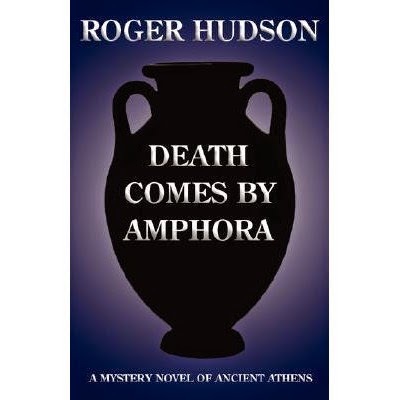 Death Comes By Amphora (2007) is the first in Roger Hudson's series of historical mystery novels set in Ancient Athens. It starts in 461 BC and introduces the 18-year-old Lysanias and his ageing slave Sindron. Lysanias is summonsed home from the colonies after his Uncle Klereides dies in suspicious circumstances. Hudson has dual Irish/British nationality. He grew up in the Surrey countryside as an evacuee from London during the War. After national service in the RAF he studied economics at University College London. He worked in journalism, technical editing, publicity and writing scripts for corporate videos. After his children grew up, he and his wife moved from London to Dublin (where she is originally from) and a decade later to Drogheda. Hudson is a member of Poetry Ireland, the Poetry Association (UK), the Crime Writers Association, the Historical Novel Society and Visual Artists Ireland. Are you this author or their agent? Contact us if you would like to add or update biography details.